The 14th Annual Women’s Sailing Conference, a program of the National Women’s Sailing Association, will be held Saturday, June 6 at the Corinthian Yacht Club in Marblehead, MA. At press time, Contributing Sponsors include the Boat Owners Association of the United States (BoatUS) and Black Rock Sailing School. The Charting workshop is among the most popular. Through combinations of hands-on workshops, seminars and on-the-water experiences, participants will learn and hone sailing skills, and network with women sailors from all points. The gathering begins before breakfast and runs through a post-conference cocktail hour where women might pick up a berth for a Wednesday night race or meet a new pal for afternoon sailing. Women of all sailing abilities are encouraged to participate. The Women’s Sailing Conference is a great way to learn from experienced and enthusiastic women sailors, and many attendees return to year after year. The workshops are numerous and varied, addressing basics as well as techniques and skills that bring new insights to long-time sailors. There will be a hands-on Introduction to Charting, a Knots workshop, and one on handling basic diesel engine problems. The Suddenly Singlehanded and Advanced Anchoring seminars are always popular. Women can learn to use springlines to turn a boat around in tight quarters, and the Crew Overboard workshop includes a live demonstration at the float before participants take to boats and practice the drill. Workshops on seasonal boat maintenance and preparing your boat for a pending storm will also be offered, while more are in development. On the water, women new to sailing will get some hands-on-the-tiller time in either a Colgate 26 or a Sonar. Intermediate sailors can improve their skills by taking a Sail Trim workshop aboard larger craft. All workshop leaders are experienced in their field. Some own sailing schools for women, such as Nancy Erley of Seattle, WA and Capt. Sharon Renk-Greenlaw of Casco Bay, ME. Beth Burlingame, an ABYC Master Marine Tech, leads the workshop on Marine Electronics/Marine Systems. There is always something for everyone’s interest and skills level. Simply by sharing experiences, women leave with skills and knowledge that contribute to better days on the water. The Conference begins at 8:30 am and ends at 5:00 pm. Raffles and a silent auction benefit the Women’s Sailing Foundation, a 501 (c) (3) organization that funds the AdventureSail® program for young girls at-risk and provides scholarships for AdventureSail® participants in learn-to-sail community programs and other venues. Course registration is on a first-come, first-served basis. Your registration fee includes a continental breakfast, buffet lunch, a day of workshops and one raffle ticket. Specific workshop information and the registration form will be available at the NWSA website this spring. For further information, contact co-chairs Joan Thayer at joan_thayer@comcast.net or Scottie Robinson at rob-son@verizon.net. We hope to see you there! The National Women’s Sailing Association (NWSA) is a program of the Women’s Sailing Foundation, an organization dedicated to enriching the lives of women and girls through education and access to the sport of sailing. To learn more, visit womensailing.org. 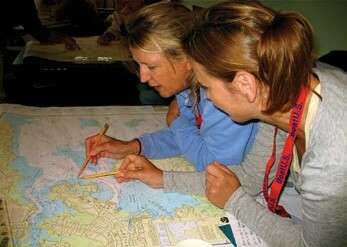 Joan Thayer is the Co-chair of the Women’s Sailing Conference.